This 4 days hands-on course is targeted toward the information technology (IT) professional who has networking and administrative skills in Windows-based Transmission Control Protocol/Internet Protocol (TCP/IP) networks and familiarity with other operating systems, such as Mac OSX, Unix, or Linux, and who wants to further a career in IT by acquiring a foundational knowledge of security topics; prepare for the CompTIA Security Certification examination; or use Security as the foundation for advanced security certifications or career roles. Register before 17 May 2019 for only RM5,300 per person. Register before 09 Aug 2019 for only RM5,300 per person. 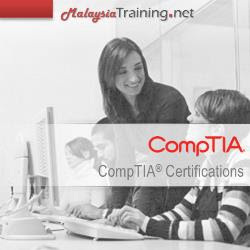 The CompTIA Security+ (Exam SY0-301) course is designed to assist you for SY0-301 exam preparation. Students and working professionals are encouraged to attend this course and utilize the given guides in preparing for their CompTIA Security+ Certification. Participants are also advised to refer to the exam objectives in order to find out how they're mapped to the course content. Identify the fundamental concepts of computer security. Identify security threats and vulnerabilities. Manage application, data, and host security. Identify access control and account management security measures. Identify compliance and operational security measures. Develop a BCP and DRP.